With Christopher Merrill, Maria Galina and Patrick Dubost. French poet Patrick Dubost’s work, both visual and oral, often experimental, leads him to encounters with sound poetry, music, theatre. He also works under his alter ego Armand Le Poête. Maria Galina was born in one of the oldest Russian towns – Tver, but spent her childhood and youth in Ukraine. 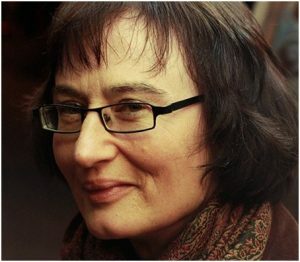 As a poet she has one of the most prestigious Russian poetry awards and works in the oldest Russian Literary magazine Novyi Mir. Christopher Merrill has published six collections of poetry and books of non-fiction, among them, Only the Nails Remain: Scenes from the Balkan Wars. As director of the International Writing Program at the University of Iowa, Merrill has conducted cultural diplomacy missions to more than fifty countries.